Why Are So Many Women Veterans Going Homeless? There are so many things troubling about that, it’s hard to know where to begin. Let’s start with the fact that veterans in general are increasingly more likely to wind up homeless or in severe poverty once they re-enter civilian life. TheCenter for American Progress cites that 1 out of 7 homeless adults are veterans. And while the end to the war in Afghanistan is most certainly a good thing, it will bring an estimated 100,000 veterans home to live lives they may not know how to handle. Physical and mental injuries are all but guaranteed for most of them, yet social programs that support assistance such as mental health care, extended disability insurance and job training are quick to wind up on the Congressionalcutting room floor. Oh, and the VA can’t find their application forms anyway. Female veterans are in this plight with their male colleagues, but staying on trend with all-things-woman, they are dealt an even more offensive blow. 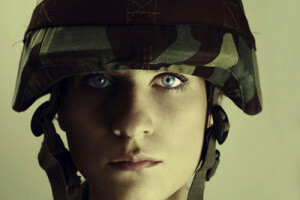 In addition to lost limbs and soaring rates of PTSD, many, many women in uniform have also endured sexual assault. The U.S. Department of Defense released a giant, damning report that reveals that women in combat are more likely to be raped by a fellow soldier than killed in the line of duty. This is not the sacrifice these women signed up for. President Obama got pissed, sure, but how long do we have to go before we find out if the problem can be fixed? Do we have to wait for another survey? It’s already too long for the women who have already served and suffered. We didn’t protect them then, and we’re not doing a very good job of supporting them when they come home (yes, we. We vote for politicians who make these rules). There is a highly promoted women’s site on the VA homepage now, but searching through all the benefits listed, nowhere is there anything specific about sexual assault, harassment, parenting or family planning. Yes, this, too, is about reproductive rights. A woman who was raped in service or gets pregnant while recovering from a crippling injury or emotional trauma may, in fact, want an abortion. President Obama signed a law at the beginning of the year that killed the military’s long-standing rule of only providing health insurance for abortions if the woman’s life was at risk. Go, Obama! But, the DOD is slow to promote this policy shift. The VA’s benefits package still explicitly states that abortions are not covered. Of course, not all female veterans returning home have been assaulted or need an abortion or even have an injury. But they’re winding up on the streets anyway. Being homeless is a tragedy for anyone, but it seems particularly harrowing for women. Where do they sleep? Where do they pee? What’s happened to their children? Are they more vulnerable now than they were on the front lines? The new documentary, “War Zone/Comfort Zone” provides much-needed context for this growing problem. It follows the crusade of two women working to open the first transitional housing for female veterans in Connecticut, and chronicles the lives of several female servicewomen from their discharge to homeless life. It airs on PBS May 30 and can bestreamed online here. We all owe it to our veterans, our communities, and ourselves to listen to these stories, absorb their impact, and then act.